The offer includes high-quality materials, of various paperweigth (90-300g / m2) and types of finishing. 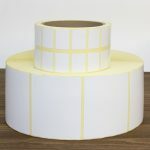 Produced from the highest quality cellulose in a layered fiber application process. High rigidity and excellent printing properties, resistance to yellowing and material aging. 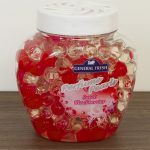 Cartons can be also decorated – gilding, silvering, painting, hologram and other print finishing techniques. Print in full color – from two or one side. 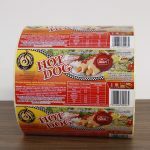 Cardboard labels are also suitable for further printing in label printers. 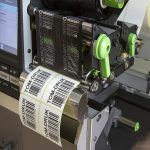 The ability to apply variable, individual data – such as barcodes – allows them to be widely used in the textile industry, e.g. as decorative clothing tags . 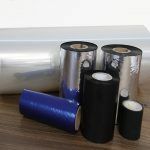 Due to increased resistance, they are also used for products exposed to adverse weather conditions such as rain or wind – eg. warehouses equipment. They are also used for marking potted plants, in botanical gardens and seedlings in the horticultural industry and forestry. 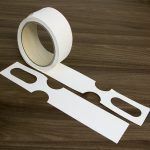 Possibility to apply perforation on the label and between labels – making it easier to peel off a part of the carton or allows for easy separation of subsequent copies. 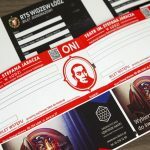 According to the perforation, labels will be perfect as entrance tickets, parking tickets or passes . 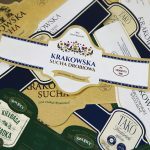 Cardboard labels are often used in clothing industry as clothing tags – in a decorative form, with the option of print refinement, combine the information function with brand presentation . Cutting dies with a hole allows you to hang the label on the product. 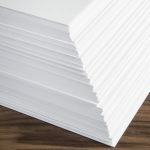 By default, a cardboard with 170g / m2 basis weight is used to print clothing labels – we also have raw materials with different thicknesses, tailored to the needs of our clients. For questions about choosing the right material, please contact our sales department .